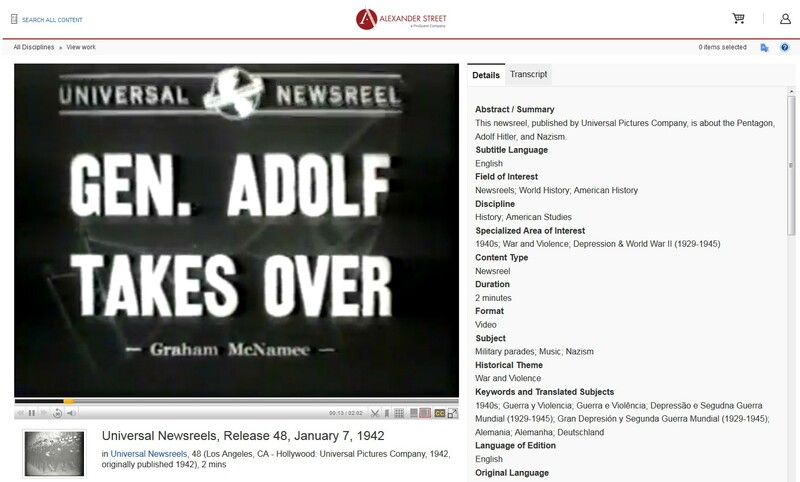 Academic Video Online is a large and comprehensive multidisciplinary collection of videos. It includes more than 60,000 titles spanning a wide range of subject areas including anthropology, business, counseling, film, health, history, music, and more. The database includes documentaries, interviews, performances, news programs and newsreels, field recordings, commercials, and raw footage. And you will find thousands of award-winning films, including Academy®, Emmy®, and Peabody® winners. This is a huge video database that gives you access to a wealth of material covering a wide range of subject areas. 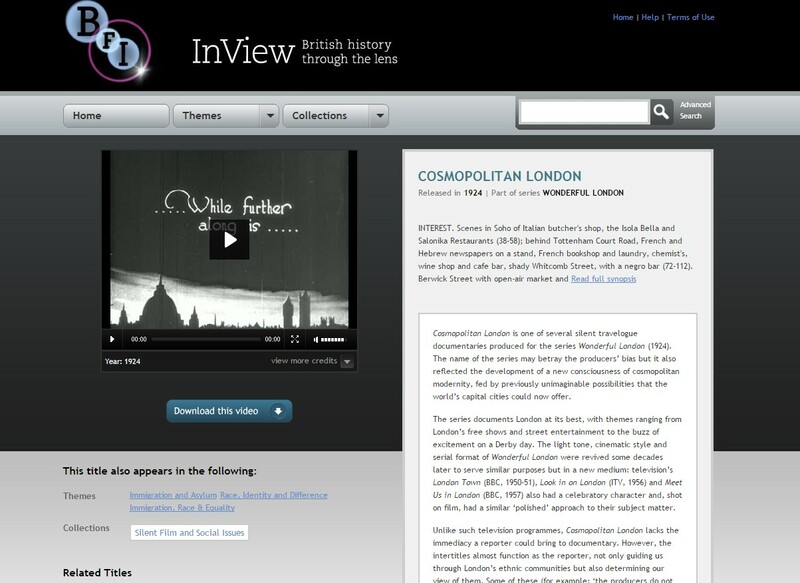 BFI InView contains over 2,000 non-fiction film and television titles from the 20th century to the early 21st. The films have all been selected from the vast holdings of the British Film Institute (BFI) National Archive and capture diverse perspectives on events, developments and debates. Explore and download rarely seen government films, written documents, newsreels, TV documentaries, discussion programmes, parliamentary recordings and much more. This is particularly good if you are looking at social or cultural history of Britain in the 20th century. Remember to click the “Login now” button to get full access to the site. 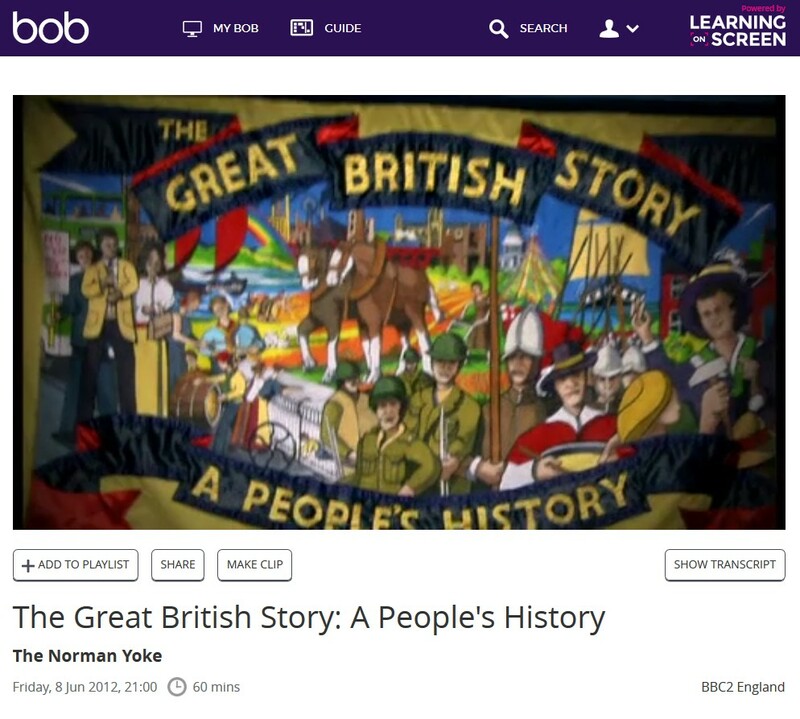 BoB is an off-air recording service that allows you, as a student or member of staff at the University, to record and get access to recordings of programmes from UK Freeview TV and digital radio channels (plus a few foreign language channels) – it’s a bit like BBC iPlayer but offers much more. There are well over 1 million previously recorded programmes available for you to watch as well as requesting recordings yourself, you can create clips and playlists, and transcripts are available for some programmes. BoB can only be used on the UK mainland but VPN might help you get around that, the first time you access BoB you will be asked to provide your University email address. While you can use it as a catch-up TV service BoB gives you access to a huge range of documentaries, films, interviews, news programmes, etc., that can be invaluable for your research. 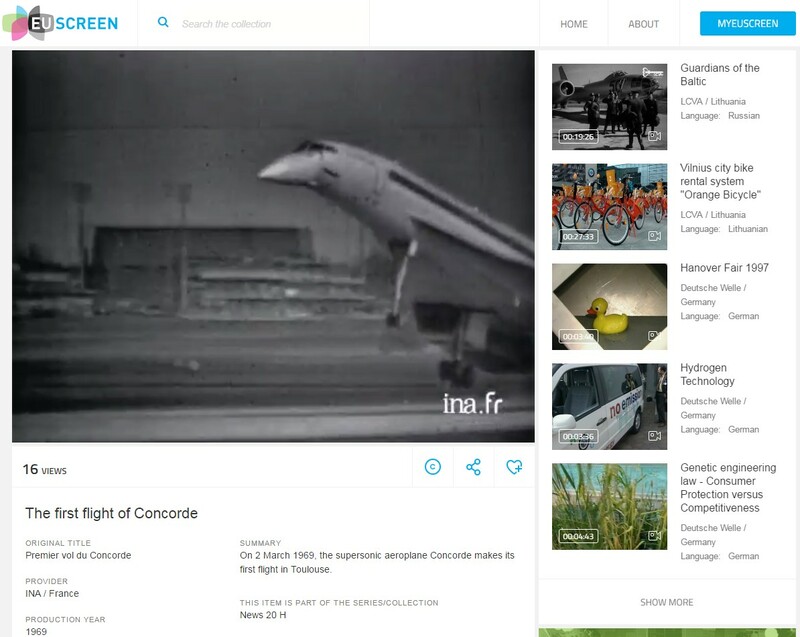 The EUscreen portal offers free online access to thousands of items of audiovisual heritage. It brings together clips that provide an insight into the social, cultural, political and economic events that have shaped the 20th and 21st centuries. As well as chronicling important historical events, the EUscreen portal allows you to explore television programmes that focus on everyday experience. This is a really fascinating resource but do note that clips, programmes and films are in their original languages, translations are not provided. MediaPlus brings more than 100,000 videos, images and sound recordings to your computer for teaching and research. The database includes news, film, image and music content including high profile collections such as ITN, Getty, Imperial War Museum, Associated Press and the Wellcome Library. 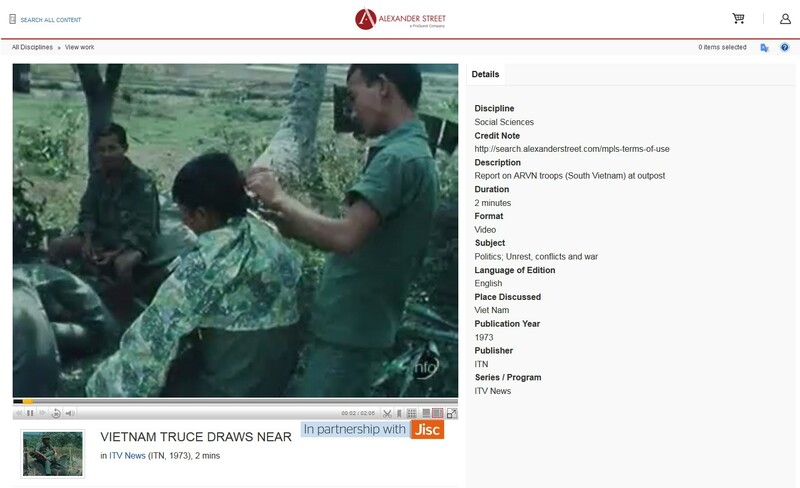 MediaPlus is provided through Alexander Street Press, who also provide Academic Video Online, this means cross-searching is possible between the two resources. The Prelinger Archives is a freely available resource that contains “ephemeral” (advertising, educational, industrial, and amateur) films. The Archive was originally founded in the early 1980s by Rich Prelinger in an effort to preserve this type of film material but was acquired by the Library of Congress in 2002. 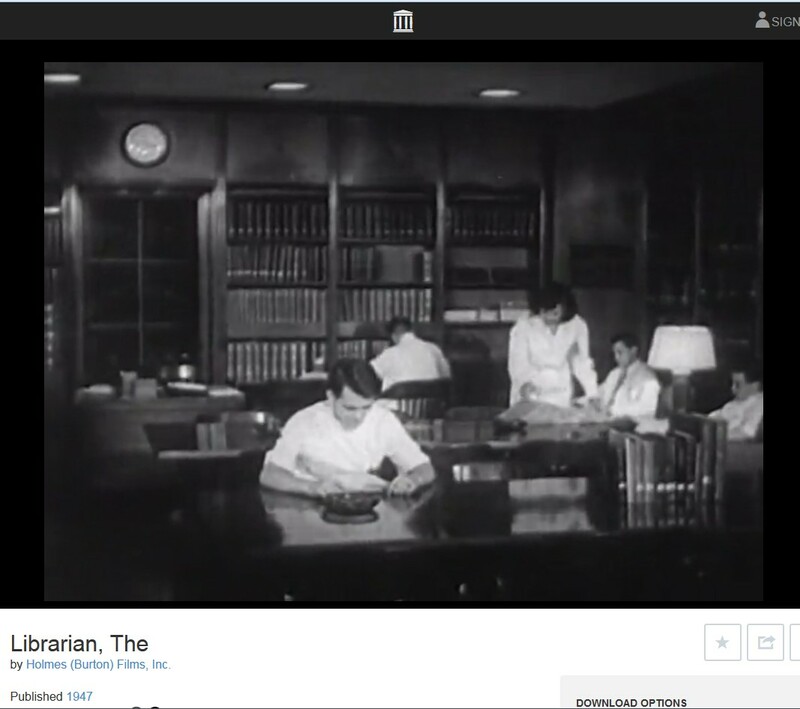 Over 6000 of these short films in the archive are available freely on the Prelinger Archives site, documenting the industrial, governmental, educational, social and cultural history of the United States in the 20th century. 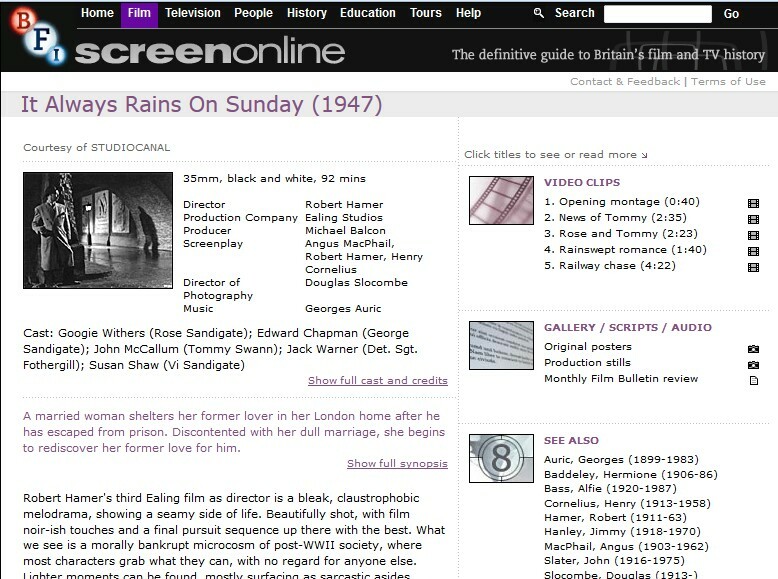 screenonline is a website developed by the BFI which is devoted to the history of British film and television. The site features hundreds of hours of video clips from the vast collections of the BFI National Film and Television Archive together with thousands of stills, posters and press books and several hours of recorded interviews with film and television personalities. This material is supplemented by contextual material commissioned for screenonline. All of these collections can be accessed via the Databases A-Z list or relevant subject database pages. Access to all of these databases, unless noted above as freely available, are only available to current students and members of staff at the University of Edinburgh. If Scottish history is your thing why not take a look at the National Library of Scotland Moving Image Archive. A number of films and clips from their collections can be watched online or you can visit them at their new home at Kelvin Hall, Glasgow. Find the previous Spotlight on… at Spotlight on Archives Unbound and Spotlight on Digital National Security Archive (DNSA). Sian Barber, Using film as a source (Manchester: Manchester University Press, 2015), accessed October 14, 2017, http://manchester.universitypressscholarship.com.ezproxy.is.ed.ac.uk/view/10.7228/manchester/9780719090301.001.0001/upso-9780719090301. This entry was posted in Box of Broadcasts, Library, Online resource, Primary sources, Spotlight on and tagged 20th century, Britain, cultural history, Databases, documentaries, Europe, film, History, primary source, social history, Spotlight on, television, United States by cstirling. Bookmark the permalink.